Do any of you have any magazines that feature The Avengers, that you think should be in every Avengers fan's collection. I'll list a few from my collection to start the ball rolling. I have a few one offs. I have quite a few fanzines, though how "essential" any of them are depends on where your interest lies. I'd say one of the most essential for all the fans of the series is the On Target Interview Special, since it has contributions from all the main players. I don't have "Meet the Avengers" (lucky you! ), but I imagine it'd be a good one to have, too, as one of the earliest examples of a dedicated Avengers publication. I have eight issues of With Umbrella, Charm, and Bowler, which I quite enjoyed. The newspaper format makes for a different read, and it had some fun stuff in it, like some fairly decent TNA fiction, and an interview with Sydney Newman (wasn't keen on TNA, kinda regretted never sticking a "created by" credit on the Avengers and Doctor Who). I have a couple of issues of Bizarre as well, which didn't do much for me one way or another. I have a solitary issue of En Garde, which I loved just because it was a fanzine written during the original run of the show, and so is a bit like a little time capsule providing a snapshot of the Avengers fandom back in the day. The issue I have is from right around the time Diana announced she was leaving, and much of the issue alternates between shocked comments along the lines of "But...but why?" and "Is it true?" and speculation about whether or not it's a good thing that they'll be getting someone new. The fanzine is American, so you can really sense the palpable frustration of the fans at being on the wrong side of the pond to read the "latest" news about this development in the press, and being forced to wait and see what'll happen with trepidation. It's so easy to look these things up on the 'net nowadays, but these guys had to hope the local press would eventually print something. I wasn't around when the show aired the first time around, so I really enjoyed having an insight into what it was like to watch the show without having a handy series guide that gave you all the background and let you know when one partner left and the next one came in. The Avengers/Patrick Macnee Fan Network Newsletter is good for this, too, only for TNA since it's published in the '70s. I have a handful of issues of it, and there are great little letters with people worrying about whether or not that CBS deal to produce season 3 is going to come through (a bit painful to read when you know how it all turned out), and pointing out that after Obsession and Dead Men are Dangerous, there should really be a "Gambit episode" to balance things out a little. (Interestingly, American fans, at least, seemed to quite like having Gambit in the mix, which makes me wonder what happened in the intervening twenty or so years, so by the time I entered the fandom, he was being bashed left, right, and centre?) Anyway, I enjoyed those for the historical value. But in terms of general series interest, the On Target/Stay Tuned runs are still your best bet. I have some ON TARGETS and STAY TUNEDs. They're excellent in terms of quality (rare information and exclusive photos from the set). I was also lucky to get some fanzines from the French fan club, 'Steed&Co'. By the way, are there some members who joined this fan club in the 90s ? The English called it 'Friends of Steed'. I don't have "Meet the Avengers" (lucky you! ), but I imagine it'd be a good one to have, too, as one of the earliest examples of a dedicated Avengers publication. Yes, Meet the Avengers is my fave magazine. It was published the year before I was born, so is a genuine antique IMHO! Lots of nice behind the scenes photos of Pat and Honor. Lucky you as well though! I'd love to have the With Umbrella and En Guarde mags. I'll have to keep checking ebay! This is where I bought Meet TA a few years ago for £23. A bargain! Rich. No, never heard of this one. I've heard of a French Avengers mag called Chapeau melon...I think there were about 30 issues. Wasn't this printed by Canal during the 00's Does anyone have these Are they worth looking out for Rich. I've seen "Meet the Avengers" on ebay several times, but it always went for much more money than my budget would allow. £23 is indeed a real bargain! Doubly lucky you! But it sounds like it's worth it, a really attractively put together magazine. I picked up all my fanzines from ebay as well--I don't know where else to find them, to be honest. I've been lucky sometimes as people often sell them as lots--I got all the WUCB issues in one lot, and the Bizarre issues came together. I think I've seen one En Guarde issue since I bought mine--it's so old that I don't think many examples survived. I wish I could source more Avengers/Patrick Fan Network issues--they don't pop up much either. Like you, I live in eternal ebay hope. Timescreen and Action TV both carried features about The Avengers/New Avengers, though would have to check to see which issues. If there are members, there are mostly on the French forum. We learnt the sad news of the death of Steed&Co's President last Monday. I also have some of those Avengers Files magazine/digest/book/whatever you call them that John Peel put together. I wouldn't classify them as essential, though. I am very sorry to hear this news. My condolences to all who knew him. RIP. It was her. Laure Sermini. Thanks to her, some French fans visited all the Paris shooting places a few years ago (I was there). 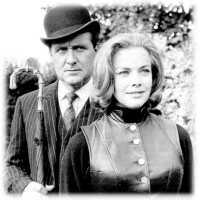 She met most of the stars of the series (including Patrick Macnee) and The Avengers was her passion. 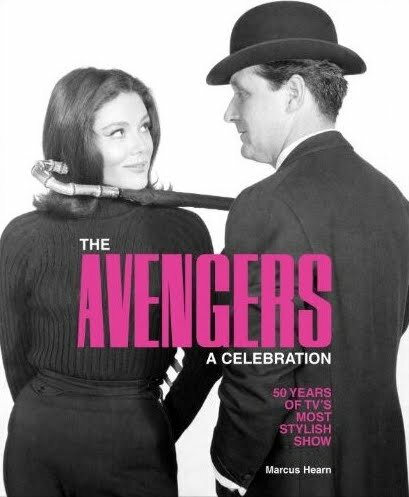 Considering it was a general magazine made for wide public consumption, rather than the aficionado, the 68 page New Avengers TV Times Souveinir Extra is very good and quite an essential. I literally read my original copy to bits when I was a young 'un and absorbed every word. 40p very well spent. I bought a copy a few years ago off eBay for considerably more. Because it was promoting The New Avengers it gets at least 50% if not more of the mag/book which is refreshing as TNA is often treated as an afterthought in some books (if not completely invisible altogether - mentioning no names... ahem ). There are still some photographs in here I've still never seen elsewhere else. It even has a board game "Purdey ... high karate kick rips tights ... escapes 6 squares while gang gawps" which would delight at least a couple of you on here. Apart from that, once you have all the Dave Rogers fanzines you're there. I still hope that someone will compile/reprint 'The Best of Stay Tuned' one day. And there are still unpublished interviews, I believe, including one of Julie Stevens which I'd still like to read. ...while Gambit gawps, more likely! Anyway Purdey wore stockings not tights (passion-killers). I still hope that someone will compile/reprint 'The Best of Stay Tuned' one day. And there are still unpublished interviews, I believe, including one of Julie Stevens which I'd still like to read. A best of Stay Tuned compilation would be great - I had no idea there were still unpublished interviews. On a vaguely related point, a while ago I managed to acquire Vol 1 issue 7 of On Target. This included a two page comic strip entitled The Rat Trap. Does anyone know whether the strip continued in later issues? That is very sad indeed. Another loss to the Avengers community. So sorry to hear that. The TNA Souvenir Extra is a good one. It's very heavily into TNA because it was for promotional purposes, as you say, but it actually did a pretty good job of covering the whole spectrum of the show as opposed to just focussing on the later years, as some stuff in the press was wont to do. I think one of my favourite parts is the article by Ian Hendry about filming season one--it's a great little insight into the behind-the-scenes workings of that part of the show. The fact that it occurred to anyone to mention Dr. Keel, let alone track down Ian, spoke to some real effort on the part of the people who put it together. Maybe the fact that Steed was getting his first male partner in 14 years made them think it was important to highlight who got the ball rolling? The board game is quite the thing--put together with nothing more than a ruler, coloured paper, a ballpoint, and someone's imagination. No photoshop required! A "Best of Stay Tuned" would be brilliant. I had no idea there were unprinted interviews floating around. Where did you hear that? It's been awhile since I read my old On Targets, but I'm struggling to remember the strip. Was it a reprint of one printed in TV Comic or the like, or a new one commissioned for the magazine? I'm going from memory (not always reliable at the best of times) but I'm sure I read in one of the editorials that Dave Rogers had either secured or planned interviews with one or more of 'the back room boys' as he put it. I also remember Julie Steven's name being mentioned, but I'd have to go through them to be sure. By the way, I didn't know her but I'm so saddened to read of the death of Laure Sermini. RIP. I've got the Timescreen mag. Issue 13, Great colour cover of Steed and Emma. Not too much inside, 6 pages looking at Avengers locations. (I've also just bought The Avengers on location book, which is great). Haven't got the Action TV mag yet. I think it's issue 8. What are the contents like Rich.